The Center region of France was the site of very large rear bases for the american troops who came to fight the armies ok Kaiser Wilhelm II alonside the allies. A commemorative plaque will be presented at the Town Hall in the presence of representatives from the american embassy in Paris on Saturday. July Saturday 8th and Sunday 9th. A week-end of activities will be held at the château of Selles sur Cher from 10 a.m to 6 p.m. There will be an american camp, as in 1917. The chateau of Selles sur Cher housed a military hospital and officiers and horses of the american army. 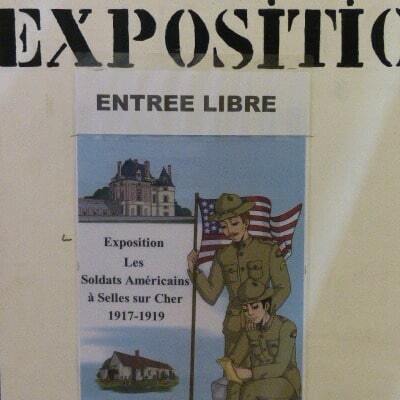 A very detailed exhibition entitled « The Americans in Selles sur Cher from 1917 – 1919 « is being held at 6 rue Docteur Massacré until 27th August 2017. Look for the american flag. Food and drinks will be available on both days.